Polish black/death overlords BEHEMOTH will return to North America this weekend for their long-anticipated headlining tour. Set to run from October 20th through November 24th, support will be provided by At The Gates and Wolves In The Throne Room. Tickets can be purchased at: behemoth.pl. See all confirmed dates below. 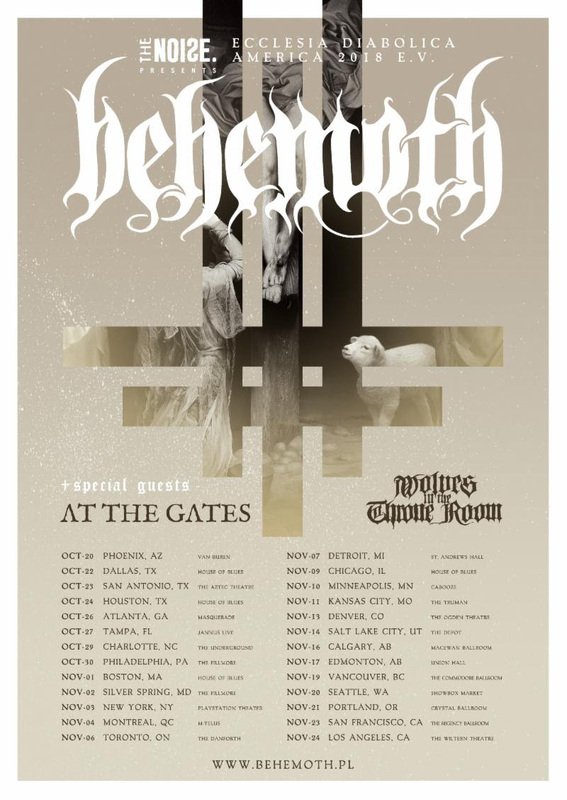 BEHEMOTH will be touring in support of their I Loved You At Your Darkest full-length, released earlier this month via Metal Blade Records. Produced by the band, with drum co-production by Daniel Bergstrand (Meshuggah, In Flames), mixed by Matt Hyde (Slayer, Children Of Bodom), and mastered by Tom Baker (Nine Inch Nails, Marilyn Manson), I Loved You At Your Darkest is a crushing salvo of black metal majesty replete with hellish riffs, thundering drum cannonades, and soaring liturgical choirs reminiscent of classic horror cinema. To preview and purchase I Loved You At Your Darkest, visit behemoth.lnk.to/ILYAYD. This entry was posted on October 20, 2018 at 12:48 am and is filed under concerts, Heavy Metal, Metal, Music, music news, news, rock music, world news with tags behemoth, Black Metal, Death Metal, metal odyssey, music news. You can follow any responses to this entry through the RSS 2.0 feed. You can leave a response, or trackback from your own site. Ohhhh we saw Behemoth with Slayer. Great gig, but I’ll bet it’s better in a hall setting instead of big outdoor stage… Taranna gig is November 6… gah, that’s a Tuesday night. Work all day, my kids have kung fu… won’t make it to the city. Bummer. Update: I have a co-worker who’s gonna be there. I’ll get a full report.